Casa del Camino is a charming ground floor apartment flooded with light. It lies next to the offices of the wine estate. While one might see the odd visitor during the day (cars are limited), in the evenings (in fact as from 7 pm), there will be no one around and guests will be able to sip a glass of wine on the bench in front of their living room. 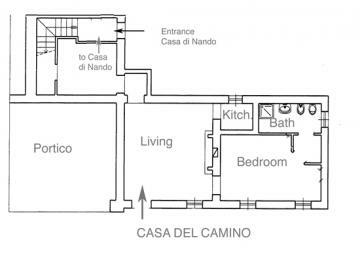 A comunicating door with Casa di Nando (sleeps 4) can be opened. The spacious outdoor pool (ideal for laps) at the adjoining golf club is open from the beginning of June to the end of August. Guests of La Montecchia can use the pool free of charge. The pool is closed with bad weather. Smaller children can have fun on the estate in a small above ground pool in a separate area of the garden which is equipped with sun beds shaded by magnolia trees. The pool on the estate is open from beginning of May to end of September. We enjoyed our stay very much. The mix of nature, culture, towns. At evenings it was so quiet. We enjoyed looking at the young falcons, the moon and the stars. The apartment is light and just perfect for the two of us. Our stay at Montecchia was splendid and we have enjoyed our being there very much. Lots of doing in Padova and other cities, Venice nearby and good hospitality from the owner. And futher on very good service and information from your agency. We would like to thank you and the owner for our great time at Montecchia. We can recommand Montecchia to everyone who wants to stay at a agro turismo in that part of Italy. We look forward to stay at an other agro turismo in another part of Italy next year. Suite à notre séjour en Italie à la Montecchia je vous informe de la satisfaction que nous avons eue,que cela soit au niveau de la réservation elle-même ou de la prestation sur place. Les locaux étaient en conformité avec le descriptif, la localisation idéale pour rayonner dans cette belle région et l'accueil très bon. Des renseignements sur place ont été utiles grâce au recueil mis à disposition dans l'appartement.Seul petit reproche:pas assez de vaisselle pour utiliser le lave-vaisselle. Nous avons l'intention de repartir en Italie l'année prochaine et bien sûr nous vous recontacterons. The casa was wonderful! We so enjoyed our vacation here. The staff was helpful and we had everything we needed. Thanks for everything. La Montecchia est un concentré de l’Italie que nous aimons: beauté, culture, authenticité, convivialité… C’est un point de départ idéal pour visiter les “Colli Euganei” . A notre avis, il ne faut pas rater les jardins de la Villa Barbarigo et le sentier du Monte Ricco à Moncelice. La Casa del Camino est si jolie qu’on voudrait garder l’adresse secrète… et la donner à tous nos vrais amis ! A very pleasant interlude. A lovely place to come home to after a hard day visiting the tourist attractions . Unfortunately, we only discovered the Osteria del Picchio on our last day. Many thanks to the staff.